If you’re interested in finding out how the entire electric violin industry evolved, this is essential reading. Watch this video of Mark’s philosophy and vision for Wood Violins. “In the course of my experiments with different electric violin styles, I built over ten different models, now part of my private collection. Since I developed the Viper, it has become my instrument of choice and when I perform, it’s usually with my trusty 7-string fretted. One of my other favorites is my Spaceolin, which I outfitted with neon lights outlining the body. Along with a bow, also wrapped with these lights, it looks really wild when the lights are turned off. I used this violin extensively with TSO and also on my version of Hoedown. Audiences love it! “All my instruments are played with a bow and since I’m a violin player and not a guitarist, the playing of these instruments is based on violin technique. The tunings are in fifths, from high to low E, A, D, G, C, F, and B-flat, but they can also be tuned like a guitar [using special string gauges]. In fact, there’s a whole group of guitarists looking to open up new realms of playing who getting into 6-string fretted Vipers right now. 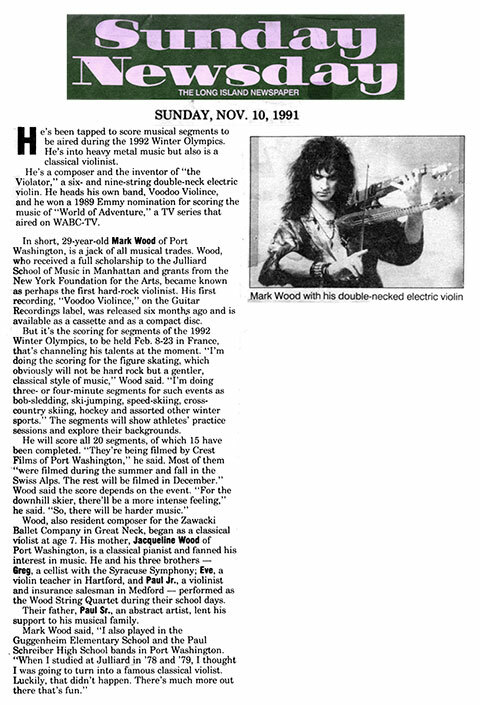 At the age of 12, Mark Wood made significant innovations to the solid body electric violin. 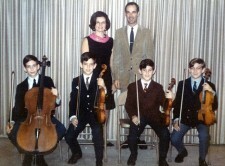 At that time, there were no real electric violins available and previous attempts didn’t really catch on. 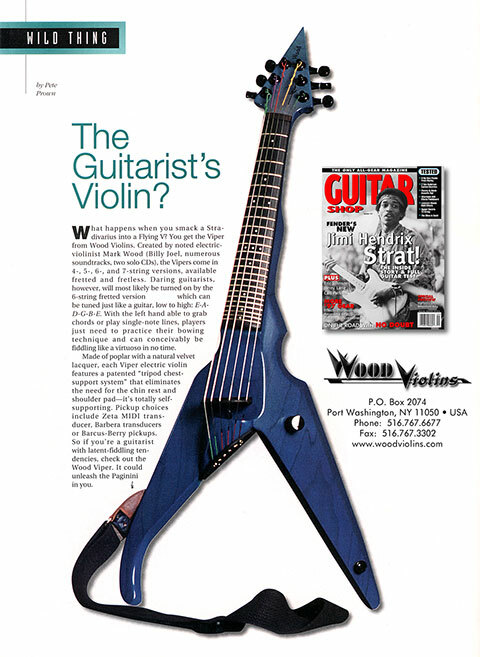 The only company that was doing anything “electric” was Barcus Berry, and theirs was just an acoustic violin painted blue with a pickup added. This was not a cool enough option for Mark, as he was watching the revolution happening in the electric guitar/bass/drums/keyboards world; leaving string players in the dust. Never once being motivated to drop and quit the viola to play the guitar, Mark set out to revolutionize the electric violin world. He believed deeply in his heart that the violin could easily compete against the guitar world in music performance. He just had to figure out how to do it. Most importantly, he was driven by music that truly inspired him. His love and passion for music was so powerful that he knew he could create the music he loved on a stringed instrument. One of the problems was that a 4-string violin was just too limiting in range to fully encompass the depth of Mark’s vision. At age 17, Mark attended the Juilliard School of Music on full scholarship to continue his musical training. After becoming frustrated with the narrowness of classical training (even though he was being groomed to become a principal player in the New York Philharmonic) and constantly being bombarded with the exciting musical adventures of Rock and Jazz, he abandoned his classical music career and began his journey towards re-inventing the electric string world all by himself. After leaving Juilliard, he moved back home at age 19 and slept on the floor of his father’s art studio [note from Mark’s wife and partner Laura Kaye: “This is where Mark was still living when he and I first started dating in 1988. It was the most romantic and bohemian environment and the walls hummed with creativity; both from Mark and from his father’s breathtaking canvases.”). For over 5 years, Mark tore apart the very foundation of his playing and taught himself improvisation by performing in a diverse group of bands based in the New York tri-state area, at last embarking on the journey of innovating the violin. All of Mark’s family on his father’s side were woodworkers and the family wood shop was attached to his father’s art studio. 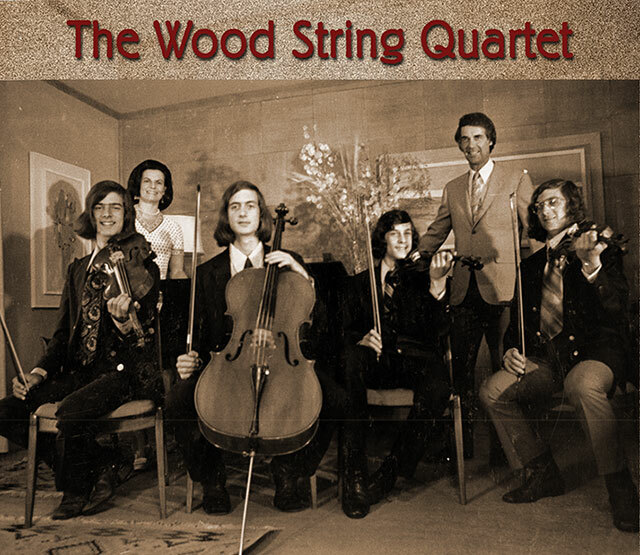 After dark, when the workers would go home, Mark would sneak into the wood shop and experiment, shape, build and address all his challenges in the electric violin world. After every performance, he would run home and fine tune his inventions; sanding, trimming, measuring, adjusting, and cutting off anything that got in his way of making music with his powerful and new vehicle. To breathe life into his musical visions, Mark needed to address the limited range of the traditional violin. 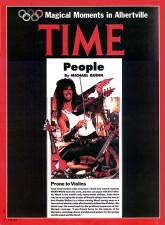 In 1977, he was the first to build a 5-string electric. 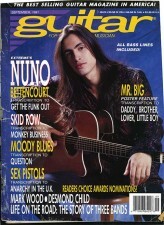 He then graduated to the first 6-string; then to the 7-string. With the addition of those 3 lower strings, he was able to have the entire orchestra in one instrument! Bass, cello, viola, and violin: E,A,D,G,C,F,B-flat. For the first time in history, he built the first multi string electrics. And the industry truly started taking notice. 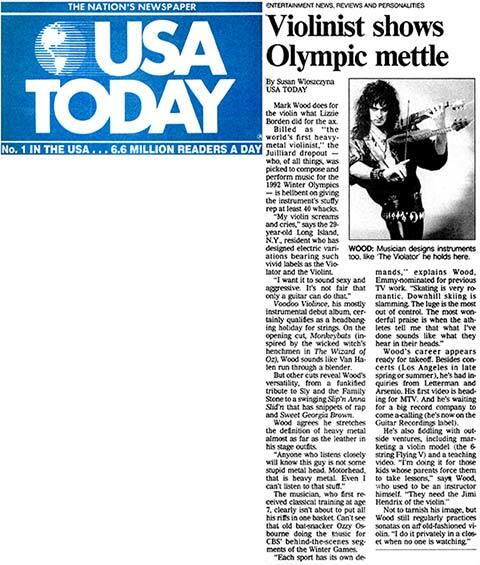 Click on the photo to check out what the New York Times had to say about Mark in 1980. In the violin/viola world, the way the instruments are held can look and feel stiff, tension-filled, and uncomfortable. When Mark witnessed musicians such as Jimi Hendrix, Jimmy Page, and Eddie Van Halen, he was particularly taken by the fluidity and sensuality of their physical relationship to their instruments. The instruments looked like they were a part of their bodies. So Mark started to experiment with inventing a self-supporting system that he later patented. The instrument could float on the player’s body, giving them tremendous freedom to move and yet not compromising the playability of the instrument. This changed Mark’s life. No longer did he feel neck strain after only an hour of playing, he experienced a new freedom physically and a truly pain free performance experience. To this day, chiropractors and neurologists recognize his invention as an important innovation for string players crippled by playing with too much tension on their necks and back, and finally experiencing a life pain free and liberating. As an amplified string player struggling to hear himself onstage, thus compromising his ability to play in tune, Mark was the first to develop a fretting system that did not compromise the beauty and subtleties of a stringed instrument. Frets came about because Mark wanted to have the ability to play a wide variety of chordal patterns up and down the fingerboard like electric guitarists do. Frets really help violinists to maintain accurate intonation for this particular kind of playing style. Although adding frets may sound like a simple proposition, Mark soon discovered that it was a very difficult task to build a fretted instrument which maintains all of the violin’s unique expressive qualities. He also discovered that the frets set up a specific visual grid that outlines patterns chords and scales far better then a fretless experience. Fingerboard mapping began his journey into accelerating the learning of these instruments. Based on his fretting system (raised frets), this type of fingerboard (lined frets) has the visual grid lines that frets do but you cannot feel them under your fingers. The Mark Wood Dot Configuration was developed immediately after the invention of Mark’s fretted system. The dot placement is very specific and it helps outline the entire fingerboard with markers that feature scale patterns and chord fingerings. 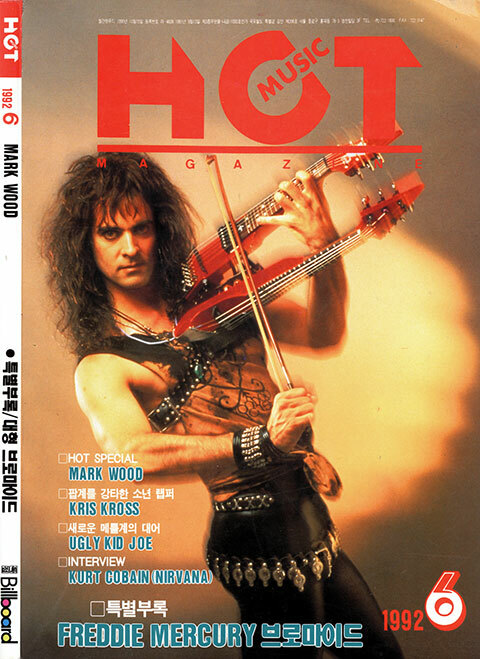 During this time, Mark was the first electric violinist EVER to be featured in Guitar Player magazine, a very prestigious and high honor for Mark, who revered guitar players as his primary heroes. 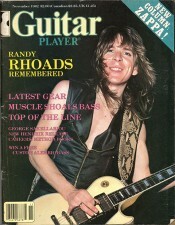 Ironically, on the cover of that very Guitar Magazine issue was the incomparable Randy Rhoads (the guy who wrote the great riff for “Crazy Train”)! 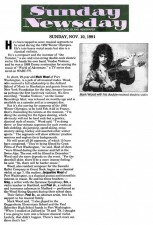 A few weeks before his untimely death, John Stix, Mark’s producer of his seminal hard rock record “Voodoo Violince,” reached out to Randy about a collaboration with Mark, after hearing about his plan to quit Ozzy’s band and pursue a deeper musical adventure for the next stage in his career. Can you imagine what would have transpired from this collaboration?!? Mark starts composing for film and TV. Along the way, he receives an Emmy award for music written for the Olympics and get nominated an additional three times for his other film and TV music. This is also a key year because Mark begins manufacturing his inventions and making them available to the general public. Enter master craftsman Joe Domjan. 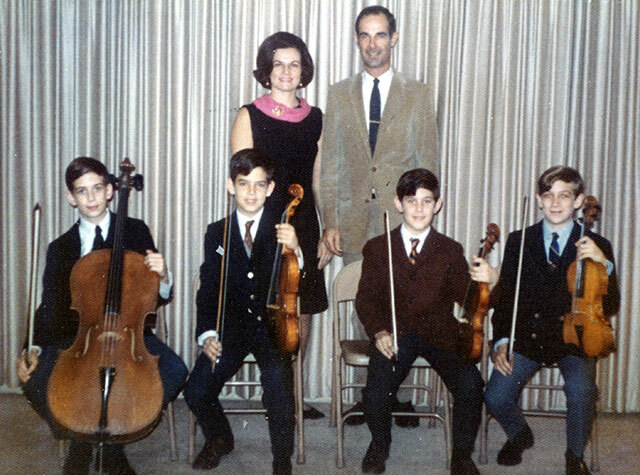 Mark and Joe start what eventually turns into what is now known as Wood Violins, a world class American made electric violin manufacturing company, with customers all over the globe. Wood Violins now has over 40 different configurations that are featured on our instruments. Something for everyone! Every famous string player worth his or her weight in the industry performs on a Wood (and if they don’t, they should!). Mark becomes an integral part of the formation of Trans-Siberian Orchestra and tours the world with them for close to 15 years, receiving many platinum and gold records for his contributions. He leaves TSO in 2009 to focus his energies on his other career (ad)ventures. The Cobra is the first self-supporting electric cello. Since cello players have been sitting down for over 400 years, we made something they can stand up for! We also gave them options to expand from 4 strings to 5 and 6, with or without frets. The Sabre and Stringray were designed for people who wanted to experience these violins on a more conventional level, since they are played with a chin rest and shoulder pad. For the past 15 years, Mark has made it his mission to help children around the world connect with their unique creative paths through music. 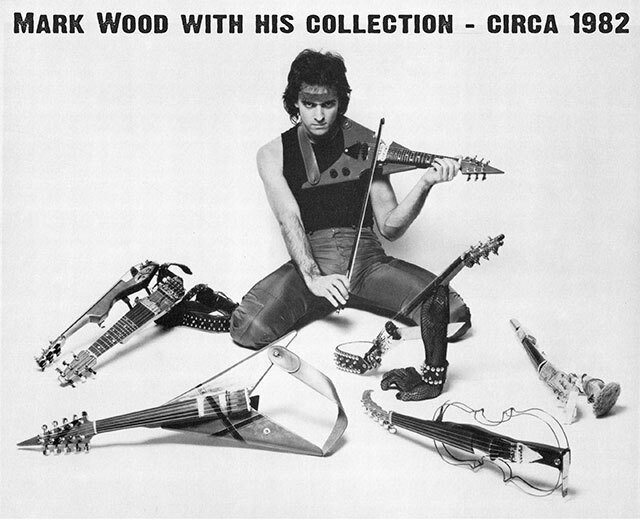 Through Electrify Your Strings (EYS), Electrify Your Choir, Electrify Your Band, Mark Wood Rock Orchestra Camp (MWROC), and the Mark Wood Electrify Your Music Foundation (his non-profit), Mark devotes much of his energy to giving back to music students. Witnessing the slow disintegration of music education support and the cutting of orchestral programs, Mark’s educational outreach program single-handily motivates and builds viable and healthy 21st century string programs that support dwindling orchestral string education programs in schools throughout the world. As Mark was never motivated to give up his violin in favor of guitar, he now inspires kids who play a stringed instrument to stick with it and discover their voices. Utilizing his new technologies as a way to expand their personal experience with their own music is a way of continuing and augmenting the rich classical tradition with 21st century innovations. Hal Leonard/Cherry Lane publishes Mark Wood’s “Electrify Your Strings” method book. After witnessing the power of Mark’s educational outreach programs, Dr. Robert Gillespie, one of the most highly respected leaders in string education, of Ohio State University (the epicenter of music education training), invited Mark to introduce his new string pedagogical training program at OSU. Set to make its debut at OSU some time in 2014, the goal of Mark’s curriculum is to empower the next generation of music teachers. 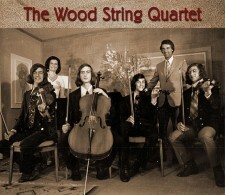 The Wood String Quartet. Can you find Mark? 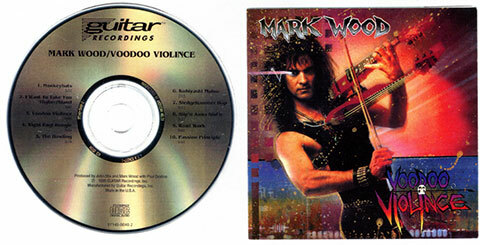 1991: “Voodoo Violince,” Mark’s first release on Guitar Recordings.